I always have, in my shop, these little postcards listed. These are love words which often only exist in one language and are very complex to translate or explain in another language. saudade is Portuguese for the feeling of longing for someone (or something) you love. 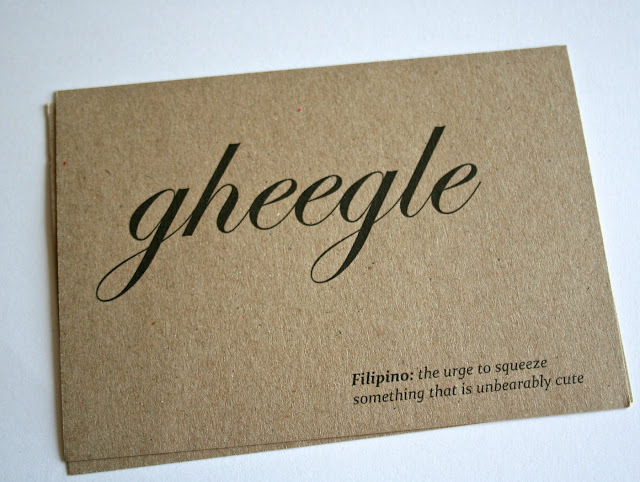 gheegle is Filipino for the urge to squeeze something that is unbearable cute. forelsket is Norwegian for the euphoria you experience when you first fall in love. I usually sell quite a few of these postcards around Valentine's Day. A few weeks ago, I received a mail from a bride-to-be who wanted to add to my collection! I jumped on the opportunity and said yes immediately. What she wanted to do with those cards was a brilliant idea too! She made me add two words. xingfu is Chinese for a sort of happiness or contentedness felt through having everything in life. ikigai is a Japanese word describing a reason for being, a reason to get up in the morning. We debated whether these should be written in their original script or romanised versions. But we decided to go for a romanised version as her guests would not have any clue as to what was written or how to pronounce them. The bride-to-be is going to give each of her guests one of these postcards and ask them to send it back to her on a precise key date following her wedding. She and her new husband will recceive these lovely cards throughout their first few years as a married couple, those unique love words reminding them of their love for each other and their commitment. What a fabulous idea!